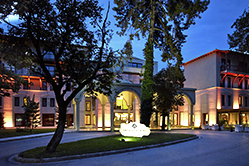 Built on a land of 13.000 sq.m., in the heart of the town of Ioannina. The hotel “Grand Serai Congress & Spa” comes to offer a brand new perception of hospitality. This is a genuine palace, which combines the traditional style of Ioannina with elements of the Middle East. The incomparable luxury and the unique facilities guarantee a starling 5* stay. Grand Serai Congress & Spa, with attention to the details of the care and well-being of our guests, invites you all year round to come and satisfy your need to “escape” from the daily routine. Opulence and comfort are not confined to the hotel’s public areas. 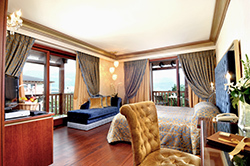 Beckoning with utmost luxury, all spacious guestrooms and suites offer an oasis of calm and tranquility. Each of the 216 rooms and suites is expertly furnished to meet the needs of the most discerning guests, beautifully appointed and elegantly decorated with warm colors and delicate fabrics. All rooms are soundproofed and have air conditioning, mini bar, safe deposit box, luxurious bathroom amenities, Internet access, direct telephone lines, satellite and pay TV. Non-smoking rooms and specially adapted rooms for disabled guests are available. Grand SERAI Congress & SPA, with attention to details for the care and well being of guests, comes to satisfy the need to escape from the daily routine. Tastes from the Mediterranean and the Middle East are created and expertly presented in a space of high aesthetics at the “Jasmine” a la carte restaurant, the “Kourabas” main bar, a sophisticated place with exceptional service, offers a wide range of cocktails or coffee by the warmth of the fire place in winter and a fantastic view of the hotel gardens. 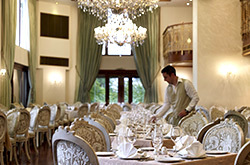 Other services include reception with lobby, daily selection of local and international newspapers, daily maid service, wakeup service, 24-hour room service, guest relations, TV corner, laundry & dry cleaning service, car rental, porters, indoor guest parking, doctor upon request, baby sitting upon request, shuttle service to and from Ioannina Airport and outdoor swimming pool. A unique relaxation spot, Grand Serai Spa, the unique spa center in Ioannina, has been created for pampering body and soul offering Thalasso aqua therapy in the indoor swimming pool, face and body treatments, massage, hair care, manicure-pedicure and a fully equipped fitness room. 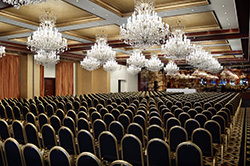 The “GRAND SERAI Congress & SPA is the perfect venue for all conference needs. With its eight versatile, highly aesthetic and state-of-the-art conference rooms the hotel has everything required for making any conference a success. Company meetings, business lunch gatherings, exhibitions, sampling, ballroom nights as well as wedding receptions can impeccably and successfully be held. Ideal for residential conferences, it provides extensive conference facilities able to accommodate up to 1.000 delegates. Whether it be a large residential conference, or a small day-meet, the GRAND SERAI Congress & SPA is as versatile as the occasion demands.